After the presentation ofThe Great Contemporary Bow Makers of the 21st Century Volume One at the Mondomusica 2011 in Cremona caused some global publicity, which even earned Darling Publications the honorable (?) description of the “Cologne-based boutique publisher” by the American Strings magazine, it took several months for master bookbinder Erwin Hendricks to finish the books for all 15 participating bow makers of Vol. One. The copies of Alexandre Aumont and Arthur Dubroca were delivered by myself at the day Morgan Andersen arrived in Paris to receive the Grand Prix de la Ville Paris for his violin bow at the E. Vatelot Competition. It made me aware and humble to realize how short life any publication has, as this bow would be great to be included in the Vol. One, as Morgan was the very first bow maker on the very first page. In a seven year project we missed that bow by three months! My personal copy (bound in the vibrant red fabric like every single one of the 100 copies) with dedications to me from almost all bow makers in the book was suddenly unfindable and already thought to be lost. But it did finally show up in Crozon (Brittany, France) at Eric Grandchamp´s home as he was wondering why all the friendly wishes and dedications of the esteemed colleagues, including his own, were not addressed to him, but to me. Today, after its safe return to the bookbinder, it carries now a dark blue cover to be better distinguishable from the red ones. A plethora of rumors and inquiries could be read on the world wide web about this Opus Magnus (Vol. One), from tracing its origin and unknown people explaining the manufacturing country to be Spain (?) to multiple copies orders from the Far East. Thankfully everybody had the understanding of waiting several months for their copy, as they all had to be stitched by hand; probably that seemed quite short in comparison with the story of my own 7 year waiting time for the finally successful presentation of Vol. One in Cremona. For Vol.Two most makers made use of the now very familiar triangular tubes from FedEx and UPS, but some makers from USA, Finland, France and Italy came personally with boxes with their bows to Cologne, bottles of red wine and other alcoholic beverages for some serious scanning sessions, the frequency of visits increased till short before the deadline. Sometimes colleagues, even understanding spouses generously took the role of bow courier. Pre-booked flights and train departures caused several nights with shortage of sleep, the egg timer proved his value guaranteeing 55-minute sleeping intervals – similar as the scanning cycle of a single bow (59 minutes). With many makers I shared intensive talks, several wine bottles followed by some exceptional eau de vie´s, which would not had taken place without this challenging project. Always in the seemingly eternal cycle of 59 minutes of a bow scan with its interval of cleaning, measuring and positioning the next bow. When I started this project (mentally in 2004, developing technically the equipment in 2005, announcing in 2006 and finally presenting Vol. One in 2011), I did not know even the names of several from the younger makers, presented today already in Vol. Two. To wittnes their development from bow to bow was amazing, from learning from masters in the Vol. One to receiving their first Certificates of Merit and Gold Medals. If the speed of making this kind of documentation in my dearly beloved medium of the printed book stays the same slow as now, we soon can see third generation bow makers! But till now we can present Emmanuel Bégin from Montreal as youngest entry in this publication, who´s first modern cello bow, made 2008 in the workshop of Yannick Le Canu, shows, as the very first bow of this Vol. Two, his already great talent. His nickname by my wife is by the way “baby bow maker”. A special friendship and co-operation with Eric Fournier resulted in a bow, stamped “Bégin-Fournier”, shown in the chapter “Eric Fournier”made in a special way of alternating of the work on all stages of the making of the bow, instead of dividing stick making by one maker from frog and button making by the other in more traditional bow makers co-productions. As the senior of this book we can welcome Risto Vainio from Finland, whose first bow of 1957 can be considered as a early milestone. Especially by showing courageously his very first bow he deserves our great respect, even more for what he reached in the following years with a lot of enthusiasm and diligence. His most recent bow, which turned out to also the last bow on the last page of this Vol. Two, was this year´s Micro Photo lens bow (2013), which he made at the age of 83! The presented Vol. Two of The Great Contemporary Bow Makers of the 21st Century here can, if we consider the Vol. One with 15 bow makers to be the Opus Magnus, indeed be described as the Opus Maximus, as it presents 20 bow makers, most with approximately each 19 bows – which makes this publication a dream for all discriminating connoisseurs of the Art of Contemporary Bow Making, showing almost 400 modern bows by 20 makers (and some sort of a nightmare for those involved with the retouching and lithographing). After Sylvain Bigot was the very last one to ship his Micro Photo lens bow for Vol. One, the honour of being the very last maker shipping the Micro Photo lens bow to Cologne to be scanned for Vol. Two, goes this time to … Dirk Löscher from Barcelona! Dirk, after heavily begging for more time, finally got a week-end more time to get a even more better finish of the polishing, decided instead to use that luxurious extra time to remove the finished head plate to replace it with a more creative ivory-ebony-ivory sandwich head plate, which turned out to be the only one of that kind of the entire book. (Bernd Etzler from Budapest shows a head plate with an opposite mixture; ebony outside, ivory inside). Some new experiences for me and some bow makers occurred in most unexpected ways. Ole Kanestrom received a shipping of two bows back from Germany to Port Townsend after weeks of delay in a seldom state to be seen; the polish melted, glue was protruding from under the silver backplate of Ole´s Micro Photo lens bow, the thumb leather brittle like cardboard; something he had never seen before. The stick of a customer´s bow warped. We suspect that maybe the opened tube at the US customs showing wood products caused a stay in a kiln dryer or microwave energy dryer. Another unpleasant discovery was that in Eric Fournier´s folder with the finished scanned 19 bows, 4 bows were double, so that Eric had to supply 4 bows in less than 3 weeks, which he did: 2 viola bows and 2 cello bows! And the quality did amazingly not suffer from such short time frame. Georges Tépho, with whom Eric is sharing a workshop in Quimper, assured me that he did not help! The presentation of the Vol. One at several occasions did lead to frequent enquiries about the selling price, which did seem for some to be a mentally insurmountable obstacle. The comforting words that indeed nobody but a very few does need such a work, and that after seeing it once, at least dreaming about it was entirely for free, surprisingly made some to re-think the general attitude towards the needs of life; arousing the desire to be in the company of the very few and commit themselves to confirmed and prepaid orders! On the other side, on some occasion I was told that the price was actually too cheap, which I humbly agreed on. The fact that it was meant seriously could be recognized in the order of 3 copies at once! Another enthousiastic bow maker stated that he saw the publication as an amazing source of knowledge and that the equivalent of learning was many times more than the bare purchase of a book. Like with all other art publications I experienced exactly the same: some people I never expected from, immediately purchased a book, others from whom I expected to be interested and capable to afford it, actually never showed interest. My utmost thanks and especially respect goes to all those who supported me not only financially by purchasing Vol. One, but a lot more important was the encouraging effect it had on me to go on with this project. The second group of Micro Photo lens bows by the here presented 20 makers varies from classical Vuillaume style to complete new bow design, not to forget the unexpected creativity, pushing technical, mechanical, optical and aesthetically boundaries with great craftsmanship, surely the first 15 lens bows of Vol. One was inspiring for some and challenging to the other. On the ever more frequent asked question whether there will be a Vol. Three can not be answered at present, although still several great bow makers and rising stars are not yet presented, but should not be missing in such an oeuvre, but future will tell. A big compliment was to see respected bow makers and experts from Paris presenting in December 2012 posters with full size classical bows with their cambers. In contrary to some opinions which saw my initial ideas of 2004 as intellectual property being copied, I need to express my happiness that my ideas were obviously interesting enough to also give it a try, or maybe even to improve. Waiting impatiently to see more attempts, realistically expecting improvements to be reached, but hopefully not too soon! Today, nearing the end of the year 2013, the digital technology already makes the equipment used for Vol. One and Two from 2005 look like a piece of prehistoric technology; today´s state of the art equipment do the same in better quality and in only 7 instead of 59 minutes! Bye the way, unfortunately the price tag for the updated version shows the triple amount. But without “The Discovery of Slowness” of the 59 minute scan per bow I would not have so many conversations with great makers and personalities, which gave me the opportunity to get to know several makers closer, not only by their great bows, but also in a lot of different facets of their mind. These shared moments I never would want to have missed. To the same team of Marco Lietz, Jörg Asmuth and Erwin Hendricks I feel obliged with uncountable thanks. I wish the reader a great time with the following 374 bows of The Great Contemporary Bow Makers of the 21st Century – Volume Two ! La première fois qu’Andy Lim m’a montré sa collection impressionnante d’archets, une question m’a traversé l’esprit : « s’arrêtera-t-il un jour? ». La venue de ce deuxième volume sur les archets contemporains et son aspect aussi gigantesque que le précédant répond bien à cette interrogation. Des dizaines d’archetiers, des centaines d’archets et plusieurs années de travail plus tard, nous est présenté cette finalisation (espérons-le pour lui) d’un projet qui, je crois, ne pourra être égalé que par quelqu’un qui partagera un amour aussi compulsif de notre métier. Un grand merci à tous ceux qui ont contribué à ce projet unique et sans précédent. Quatre ans plus tard, je présente deux archets au concours international de Mittenwald qui sont finalement primés. Gonflé par ce succès, je me décide à contacter Andy et lui demande si mon travail pourrait figurer dans son livre. Ce sera oui, pour le vol. 2. Commence alors une série d’allers et retours pour « scanner » les archets chez lui, à Cologne, et la lente découverte d’un univers singulier et d’un drôle de personnage : à la fois bordélique assumé mais rigoureusement organisé, mélomane averti et collectionneur, agité attentif, amateur d’art, brouillon méthodique et musicien exigeant donc potentiellement contrariant. Ajouter a cela un débit de parole peu commun et une remarquable gourmandise, chaque visite promettait d’être un souvenir…Et ce fut le cas. Rarement le programme de prise de vue ne fut correctement tenu, mais le déjeuner était immanquablement excellent et le plaisir des yeux satisfait en matière d’archets contemporains ou anciens. Avec, en plus, la nette satisfaction d’avoir fait tenir un séjour linguistique d’une semaine en une demi-journée. Bref, une excitation joyeuse et communicative qui se retrouve aussi à chaque exposition sur les stands Darling. Reste une question : Pourquoi fait-il tout ça ? Certainement pas pour l’argent, mais sans doute pour en être…lui-aussi. Huit années de travail, de patience et de ténacité on permis à Andy Lim l’éclosion des deux volumes du présent ouvrage. Celui-ci témoigne avant tout de sa passion pour les archetiers et les archets. Ce livre concrétise cette longue aventure humaine et est un véritable hommage à la profession. Par sa facture, son ampleur et son raffinement, il veut s’inscrire dans le temps, comme une cathédrale. En cela, Andy Lim a fait œuvre. La beauté et l’acuité des photos transmettent mieux que les mots l’indescriptible et la sensualité de ces objets, premier maillon de la résonance musicale. Ces prises de vue spectaculaires révèlent les différentes personnalités des artisans. Chaque archetier doit sa technique et son style à la tradition dans laquelle il s’inscrit. Le métier se transmet dans les ateliers et c’est depuis toujours les maîtres d’apprentissage qui forgent les premiers pas de la personnalité des archetiers. Les trois écoles principales, l’école allemande, anglaise et française sont toujours vivantes. Aujourd’hui elles ne sont plus distinctes géographiquement, elles se sont dispersées à travers le monde grâce à l’accueil et la générosité de nombreux archetiers formateurs pour les nouveaux impétrants. Grâce à ce magnifique livre, puisse de nombreux musiciens, gens du métier, amateurs d’art trouver un nouveau regard sur ces objets si concrets et si mystérieux. Ces vingt cinq années d’archèterie passées m’ont donné le plaisir de voir ce métier s’ouvrir dans le partage de qualité et de la passion avec les confrères artisans et musiciens de tout horizon. Ce livre témoigne d’une génération excellente, folle mais sincère, de nos archetier et luthiers contemporains . Esquisser en quelques lignes une préface pour un si grand livre est forcément réducteur! Je m’y essaie avec humilité, mais également avec une grande fierté : celle de participer à ce projet d’édition hors-norme, mené par un auteur aux idées foisonnantes et novatrices. L’histoire de l’archeterie est longue, riche, et cet ouvrage capture un nouveau moment de cette histoire et dévoile l’étonnante contemporanéité de ce savoir-faire. Cette mise en lumière est importante, car l’héritage des archetiers anciens est bien-sûr une inépuisable source d’inspiration, mais les créations des archetiers contemporains le sont tout autant. Aujourd’hui, j’ai le sentiment d’avoir réussi à développer un rapport personnel à l’archeterie. Devenue très tôt une passion, en découvrant toutes les facettes de ce métier pluridisciplinaire, la diversité des matériaux à façonner n’a de cesse de m’étonner. Et de ce rapport particulier à la matière découle aujourd’hui tous mes choix de vie. Mon épanouissement dans le travail nourrit des choix personnels plus justes, et permet à mon inspiration d’être mieux entendue. Le temps qu’il faut pour créer un archet, ses courbes, sa subtilité, tout cela aiguise mes sens et me permet d’affiner pas à pas mes choix au quotidien. La création de ce livre est une aventure qui a nécessité un temps long de maturation. Il permet d’apporter un souffle de fraicheur dans un savoir-faire traditionnel rendu quelque peu figé par sa codification. L’archèterie est bel et bien en mouvement, en constante évolution, et ce livre en fait parfaitement état. Il permettra de prendre conscience que les sources d’inspiration ne sont pas seulement dans les livres d’histoire, mais aussi plus vivantes que jamais. Ce livre n’ est pas qu un gros livre: c’ est un objet d’ art! Un artiste, éditeur, amateur et collectionneur passionné, y montre, en grandeur nature, un ensemble conséquent d’ archets contemporains. Ils sont à part entière dans ce qu’ ils font. Ils se reconnaissent implicitement dans une communauté qui, à travers des valeurs partagées intrinsèques à leur métier, les soutient dans les recherches de leur avenir. Cet Hommage mérite d’ être Honoré. Ensimmäinen kontaktini Andyyn oli puhelu, muistaakseni joskus vuoden 2010 aikana. Jo tuolloin oli puhetta etupäässä jousista. Andy muisti minut Musicora messuilta soittimieni takia noin 15 vuoden takaa – jouset astuivat kuvaan minun osaltani vasta myöhemmin. Oli hyvin imartelevaa, että Andy oli kiinnostunut monen nimekkään jousenrakentajan ohella saamaan minut mukaan tämän kirjan toiseen osaan, vaikka en pidä itseäni varsinaisesti jousenrakentajana. Asia kuitenkin jäi, sillä ajatus uniikin linssijousen tekemisestä ei minusta ensin vaikuttanut alkuunkaan kiinnostavalta. Mielessäni pieni kupumainen linssi ei suostunut luonnollisen yksinkertaisella tavalla osaksi kaunista frossia. Toinen ongelma oli löytää 19 jousta ja saada ne kuvattaviksi Kölniin. Tämä tarkoitti yli neljännestä kaikista tekemistäni jousista, joita on ripoteltuna ympäri maailman. 2012 Mondomusica messuilla tapasin lopulta Andyn henkilökohtaisesti. Hänen tarttuva energiansa, perfektionismiin pyrkivä fanaattisuutensa ja usko mahdollisuuksien rajattomuuteen tuntuivat hyvin läheisiltä luonteelleni. Ja niin olin taas mukana juonessa – ensimmäinen jousi lähti Andyn matkaan jo Mondomusicasta. Tätä seurasi minun ja jousieni vierailu Kölniin, missä intensiivisten 36 tunnin aikana tutustuin paremmin Andyn tapaan perehtyä ja keskittyä oleelliseen, olkoon aihe mikä tahansa. Projektin viimeinen punnerrus minun osaltani oli, onneksi vain kolme viikkoa määräajasta myöhässä valmistunut linssijousi. Ilman Andyn antamaa kipinää en olisi koskaan tehnyt sitä. Nyt olen tyytyväinen, että näin kuitenkin kävi. Kiitos Andy! Olen aina uskonut, että kaiken kauniin ja merkittävän luominen vaatii oikeanlaista hulluutta, loputonta tiedonjanoa ja väsymätöntä periksiantamattomuutta. Andy on tästä hyvä esimerkki ja oiva katalysaattori meille kaikille. This book is a gesture. The expense and the format ensures that it will be seen only by a limited number of people, and that, for the most part, these people will be specialists or connoisseurs of the subject already. But the subject itself, the bow, is an item already for the specialist, and we, their makers, are rare practitioners of this highly specialized art. Our creations are also manifestly valuable, and will likely be well cared for and passed on to future players and collectors. This book is a kindred creation. Because of it’s exquisiteness and the care taken in it’s creation, we can expect it to be passed on in good condition, even as the world moves more exclusively to other media. So through our collective works, our bows, and this book, we are sending messages forward in time. We can look at older bows and instruments and feel something of the lives of those who created them; those who look back at this book will get a picture of the state of our art now, at the beginning of the 21st century. Hello, 2100! Thank you, Andy, for making this gesture, and inviting us all to participate. So, after further discussion, I chose instead to make a silver mounted bow. Andy also received a second frog and button set available in gold which used the very last of my scrap. This is also a nod to the long standing tradition of having a reserve frog and button made for a special bow,. So when viewers find the only silver mounted lens bow in this book, they will know a little more about why it is here. I was delighted to be asked by Andy Lim to participate in this extraordinary project of his. It’s an incredible undertaking on his part, and no doubt future generations (as well as our own!) will thank him for his endeavours and his dedication. It is a privilege to be involved. It is also a privilege for me to be a bowmaker. I love this work, the learning is endless, and I love so many of the people who inhabit, or are connected with, the fascinating world of this craft. Bogenbau , ein altes Kunsthandwerk – und nie so lebendig wie heute. Das bestaetigt die Anzahl der zeitgenoessischen Meister und die Qualitaet ihrer Produkte. Einen Ueberblick bekommt man in den zwei grossartigen Buechern von Andy Lim. Vielen Dank Andy und allen anderen Personen, die dieses Projekt unterstuezt haben. Early in 2005 Andy Lim called me for the first time. He introduced himself and his proposal to publish a two volume book featuring the work of contemporary bow makers. The idea for the book was ambitious, original, farsighted, and seemingly too grand in scope to be completed. In 2005 only a handful of bow makers had already met Andy. Naturally, we were intrigued at the idea of the book but could Andy actually get it published? It wasn’t unreasonable to have doubts early on. Gradually over the coming years Andy’s dedication to the project became apparent. His consistent enthusiasm, conscientiousness, generosity, and dedication to contemporary bow makers and their work has earned the trust and respect of many makers. Andy’s efforts have not only inspired bow makers, they have also strengthened our community and brought us a bit closer as a whole. With the publication of „The Great Contemporary Bow Makers of the 21st Century“ Andy lim has left future generations with a valuable and unprecedented record of the work of an important era in bow making. con il coraggio della realtà oggettiva. attraverso l’individuazione di un numero definito di creazioni. familiari hanno conservato la loro espressività nel corpo ligneo dell’arco. di individuare diciannove capitoli di una mia ipotetica biografia, realizzata attraverso le immagini. di esperienze professionali e umane, che suonano armoniose nel tuo volume. voltarmi: il passato non si era dimenticato di me, né io di lui. Permettimi ancora di esprimerti la mia più sincera gratitudine. Quel témoignage puissant , l’archèterie contemporaine comme nous ne l’avions jamais vue représenté ! Nous ne pouvions témoigner mieux notre gratitude a Andy pour cet ouvrage qu’en te confiant notre travail . Bravo et merci . La Micro photo et combien d’ innovations chez Vuillaume, mais n’oublions pas d’autres comme Tourte, Pajeot …Le travail des archetiers se nourrit des influences de ceux ci. Pourtant l’excellence de notre profession au 21ème siècle se mesurera à notre capacité d’innover. Face aux contraintes concernant les matériaux que nous avons (avions) coutume d’employer ; il existe de nouvelles pistes a explorer, a nous de retourner ses contraintes en un puissant moteur portant notre art (au service de la musique !) vers de nouveaux sommets. Seulement deux tomes , pourrait on dire, mais quelle somme de travaille ! 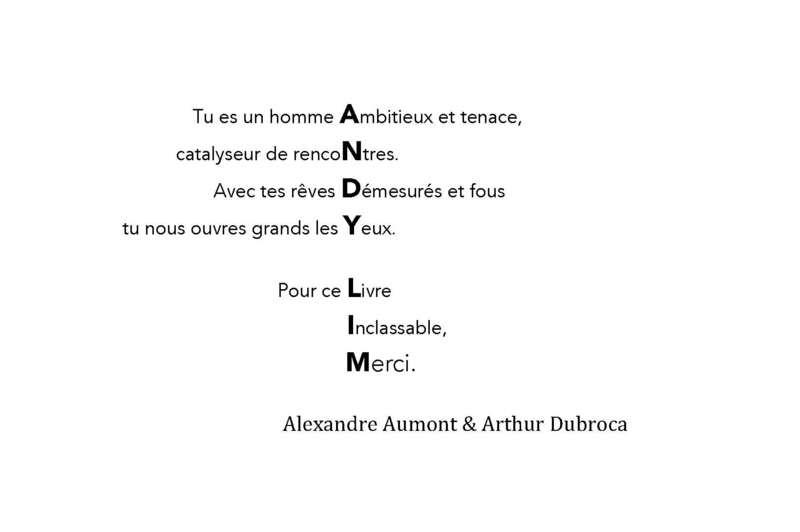 d’autres auraient certainement pu témoigner de notre métier, Andy a permis cette aventure d’autre auront peut l’intelligence de la continuer…Andy tu es le meilleur !